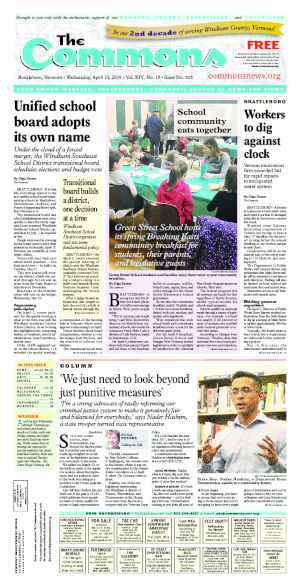 BRATTLEBORO—BRATTLEBORO — The Selectboard passed the Fiscal Year 2019 utilities fund budget at the June 19 regular Board meeting. The Board discussed the topic at a previous meeting, and requested the town manager staff present the data in a different, more simplified format. Town Manager Peter B. Elwell brought that information, which met Board members’ approval. Elwell explained that the fund goes through planned, periodic ups and downs in the revenues and expenses lines, and overall, the fund is stable. The budget, which calls for revenues of $6,174,187 for FY19, requires an increase of 1.5 percent in the water bill paid by town landowners, and a 6 percent raise in the sewer fees. Interested parties can view the FY19 Utilities Fund Budget at www.brattleboro.org or by contacting the town offices. BRATTLEBORO — At the June 19 regular Selectboard meeting, Department of Public Works Director Steve Barrett announced the recent release of the 2017 drinking-water quality report. Barrett explained this annual report tracks information on the town’s municipal drinking water from the previous year. The report includes information on the town’s water sources, detected contaminants and their levels, and how this compares with U.S. Environmental Protection Agency regulations. “It’s kind of a report card for the water system,” he said. 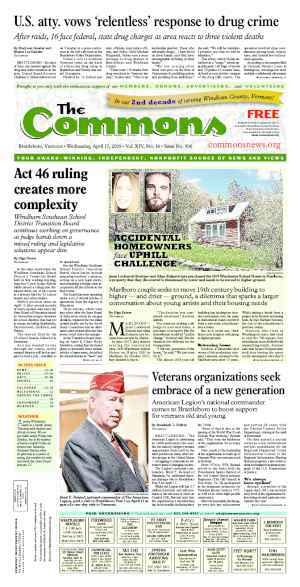 How did Brattleboro do in 2017? “The Brattleboro Water Department does have good water, and we have good reports because of that,” Barrett said. Town Manager Peter B. Elwell noted the town’s drinking water will be on the agenda for full discussion at a Selectboard meeting in the fall. To read the 2017 water quality report, visit the town’s website at www.brattleboro.org or call the Department of Public Works at 802=254-4255. BRATTLEBORO — The Selectboard approved a bid for repairing a portion of the town’s wastewater-treatment plant. At the June 19 regular Board meeting, a motion passed to award the Gustavo Preston Company $15,825 for the work. Town Manager Peter B. Elwell noted this bid is an estimate, and the amount may be higher or lower depending on actual parts and labor involved in the repair. Department of Public Works Director Steve Barrett explained what the broken system does, why it’s important, and how it likely failed. The system in question takes wastewater after treatment, and recycles it into a separate system where the water gets used in heating and cooling, operating the biosolids press, and for washing tanks. “All that water is recycled and reused in the facility itself,” said Barrett, who noted, “it saves millions of gallons of fresh drinking water a year,” and thousands of dollars. The system is computerized and automated, and Barrett described it as “fairly sophisticated.” He said it likely failed because of a power surge or lightning strike. While other components of the plant were protected, this portion wasn’t. “We think it’s essential,” Barrett said. The Selectboard agreed and passed the motion to award the bid for the repair. BRATTLEBORO — At the June 19 regular Selectboard meeting, Town Manager Peter B. Elwell presented his staff’s recommended schedule for the Board’s discussions on parking capital improvements and the parking study’s follow-up. During previous Board meetings, members asked Elwell to create a more manageable process for the multi-faceted topic, instead of asking the Board to address it all at once. 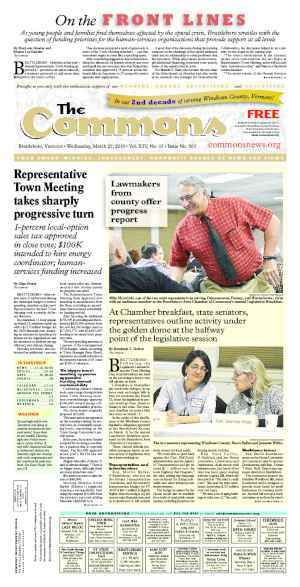 Town Manager’s staff created two “clusters that fit together well,” said Elwell. The Selectboard agreed. On July 17, the Selectboard will discuss parking meters: what kind, what forms of payment they’ll take, and whether smartphone applications are an option. Also on the agenda: financing options for capital improvements, repairs to the Transportation Center, and bicycle parking. The topics on the Aug. 7 parking agenda include painting and lighting at the Transportation Center, shared parking agreements with private property owners, improvements to signage and public information, and pricing adjustments “that may be either strategically desirable or may become necessary” to fund capital work, Elwell said. These meetings, like all Selectboard meetings, are open to the public for Brattleboro residents and non-residents. BRATTLEBORO — In response to results from the downtown parking study the town commissioned, Brattleboro will soon get more designated bicycle parking, at least during the warmer months of the year. They contain bike racks, sometimes a bicycle pump, and often decorative planters. “It has some beautification with it,” he said. The proposal is to install the parklet in one Main Street vehicular parking spot in the spring, and remove it in the fall. The Department of Public Works can easily install it and remove it by lifting it up, Elwell said, and “we will implement it as soon as we can." Elwell said the parklet is a good solution for centralized bicycle parking in a historic downtown with relatively narrow sidewalks. Coincidentally, Montpelier has a parklet for sale for $2,000, said Elwell. The town teamed up with the Downtown Brattleboro Alliance to cover the cost. The town will pay $1,000. DBA executive director Stephanie Bonin said that her organization, VBike, and a few other entities are committed to raising funds for the remaining $1,000. It requires little work, and represents “a significant gain for us in the downtown amenities,” Elwell said. He added the parklet is just one step toward providing downtown bike parking, which the parking study and survey identified as priorities. BRATTLEBORO — The Selectboard approved borrowing $500,000 from Brattleboro Savings & Loan to finance the purchase of a new aerial ladder truck. This was approved in March by Representative Town Meeting. At the June 19 regular Selectboard meeting, Town Manager Peter B. Elwell explained that the council advised the town to provide additional documentation to assure Internal Revenue Service regulators that the debt qualifies as tax-exempt municipal financing. BRATTLEBORO — Recreation & Parks Director Carol Lolatte and Brattleboro Skatepark is Coming (BASIC)committee members Jeff Clark and Elizabeth McLoughlin brought two skatepark-related items to the June 19 regular Selectboard meeting. After years of planning and location changes, it’s time to design the skatepark. “To be sitting before you tonight to talk about the design phase is an exciting crossroads for us,” Lolatte said. The quotes ranged from $23,000 to $49,645. Lolatte briefly described the comprehensive rating system BASIC and Lolatte used to assess the bids and the companies that submitted them. Although “99 percent of the time, I am recommending the low bid, this evening I am not recommending the low bid,” Lolatte said. She suggested Stantec, a company based in Boston and Burlington. Their bid was for $42,350, and they won points for their experience building skateparks in cold weather locations, their local and regional presence, and the fact that their bid was “very comprehensive and direct,” Lolatte said. Board member Shanta Lee Gander supported the choice, and noted Stantec’s locations allow the town to build a relationship with a regional firm. The Board approved the contract with Stantec. They also approved accepting and appropriating a $3,000 grant from the Vermont Community Foundation to BASIC to help the organization pay for the skatepark’s design and construction. BRATTLEBORO — Town Manager Peter B. Elwell announced the town’s receipt of a $300,000 grant from the Department of Corrections to fund two years of operations of the Brattleboro Community Justice Center. At the June 19 regular Selectboard meeting, Elwell explained the DOC is the justice center’s primary source of funding, and this grant covers fiscal years 2019 and 2020. Elwell noted the town supports the justice center by acting as the organization’s fiscal agent and bookkeeper, and the center pays no rent to the town for their offices in the municipal center. The justice center also does some additional fundraising, he said. The Selectboard voted to accept and appropriate the DOC grant. 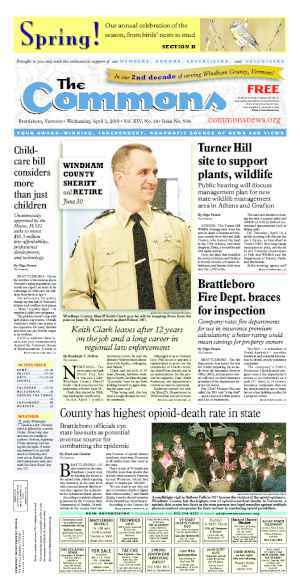 BRATTLEBORO — At the June 19 regular Selectboard meeting, the Board approved the Fiscal Year 2019 contract for emergency medical services with Rescue Inc. The town’s assessment, $240,792, includes a discount of $40,000, but that discount will decrease next year. Town Manager Peter B. Elwell explained. In the past, he said, the town provided services to Rescue Inc. that other towns didn’t provide. Because of this, Rescue gave the town a discount. A few years ago, Rescue assessed the situation and realized the town was no longer providing those services, and after their own careful analysis, the town agreed. Originally published in The Commons issue #465 (Wednesday, June 27, 2018). This story appeared on page B4.